Humans fall into definite stereotypes of retirement: days spent golfing, taking long cruises and attending early-bird specials. Racehorses have their own typical post-career path: once their time on the track is declared over, they usually end up as pasture ornaments or family pets. The Retired Racehorse Project is working to change that perception. The local contingent of this effort is Sandy trainer Kryss Helfrich. Helfrich has trained and rehabilitated retired racehorses at Cedar Creek Stables in Sandy for the past three years. This year, she hopes to go one step further by training them for the Retired Racehorse Makeover Project challenge — showing, ahem, neigh-sayers from around the country that her horses' useful lives are far from over. Bright and early on Wednesday, Sept. 26, Helfrich and her thoroughbreds, Wicked Laugh and Last Call Lobo, will travel to Lexington, Ky., to compete in competitive trail riding and freestyle events. Along the way, the trio will stop to ride in various locales, including Idaho, Wyoming and Nebraska. Helfrich is the only Oregonian going to the makeover challenge, and she's also the only person taking siblings. Both Wicked and Lobo are children of the retired Kentucky Derby racer Demon Warlock. From that, Helfrich has coined the slogan "Running with Demons" for her equestrian endeavor. "I've made it my own personal mission to show the world what thoroughbreds can do," Helfrich said. In the Western horsemanship world, thoroughbreds are typically not the first choice for trail riding and are thought of as being wild cards. Regardless, Helfrich has trained Wicked and Lobo to defy expectations with the use of a 4-acre obstacle course at the stables. "Thoroughbreds haven't in the past been as useful after the track," Helfrich noted. "They really had three fates — as a breeder, an English rider or in polo. The Western industry tends to stay away from them. (But) they have a bigger heart, a bigger drive and bigger loyalty, (and) they're bold. Whatever you put in front of them, they do their best to accomplish." It could be said Helfrich is of a similar spirit. She was in a serious accident four years ago and had to relearn to walk and ride. After that she took every new challenge head-on, including the challenge of rehabilitating Wicked and Lobo. "I've always been a bit of an adrenaline junky," she admitted. "To me it's just a privilege to take them. Even if they get there and they act like thoroughbreds, I win." A Boring native, Helfrich grew up on a quarter horse production ranch and has ridden horses her entire life, actively taking part in Future Farmers of America (FFA) and showing in the American Quarter Horse Association throughout high school. When she was in her mid-20s, Helfrich took a job as an exercise jockey. "That's where my love for racehorses began," she explained. "I'd always wanted to be an actual jockey, but my mother told me I had the wrong genetics. Some of my greatest memories are from being an exercise jockey." Regardless of the horses' past injuries, they have recovered well enough to put in about 800 miles collectively in the Mt. Hood National Forest in training. Each trainer competing in the Retire Racehorse challenge have 10 months to train the horse(s) in their disciplines. "We are in tough, rough country and (Wicked's) 100 percent reliable," Helfrich noted. "To me, we're just blessed they let us on them." At the challenge, the trio will compete in two disciplines, trail riding and in the freestyle category, which entails completing a routine to music. 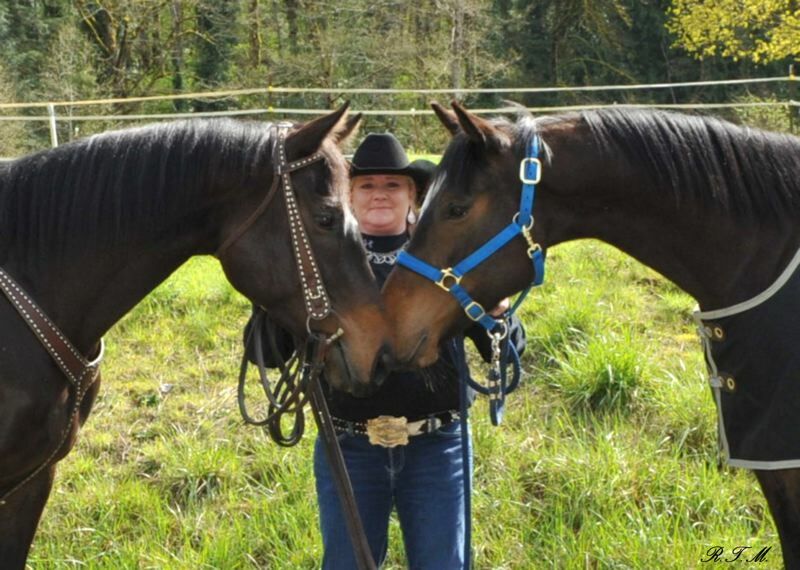 Though Helfrich is traveling with a small group comprising her husband, her apprentice Ari Milne, and her two horses, there are still several ways for Sandyites to support her endeavor. From 8 a.m. to 11 p.m. Saturday, Sept. 15, Helfrich and her crew will host a gaming show fundraiser at BRN4D Arena, 17845 S. Harding Road, Oregon City. The event is set to include barrel racing — on horses and on stick horses — pole bending, key races, Texas barrel racing and much more. Awards will be given out for each competition, ranging from buckles to saddles to cash jackpots. You can also vote for the Sandy team on the last day of the competition, Oct. 7, via text. Details on how and when to vote will be released in The Post closer to the event.